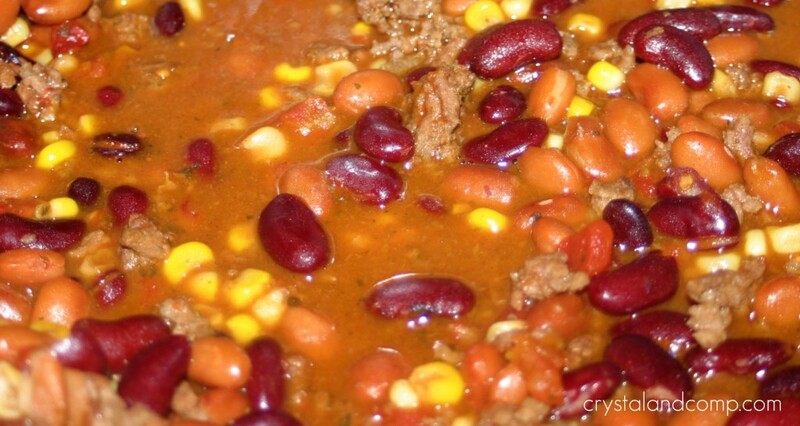 Recently we made the Crockpot Lady’s delicious Taco Soup. It made plenty and there was a decent amount of leftovers that I did not want to see go to waste. I am all about making it once and serving it twice. Simply take your leftover soup and strain out the juice using a colander. Or, you can spoon out the meaty bean mixture removing the juice if that is easier for you. You will need about 2-3 cups of the mixture. Spoon a few heapings of the mixture onto your tostada shells. Top with cheese if you choose. Bake in a 350 degree oven for 15 minutes or until the cheese is melted. Remove the tostadas from the oven and top with your favorite yummy stuff like lettuce, sour cream, salsa or guacamole. And how do you like this nifty recipe printable, just for you! A perfect way to use up leftover Taco Soup. Serve with your favorite side of rice. You could also substitute the tostada shells for taco shells. Toppings: cheese lettuce, sour cream ,salsa, guacamole, etc. 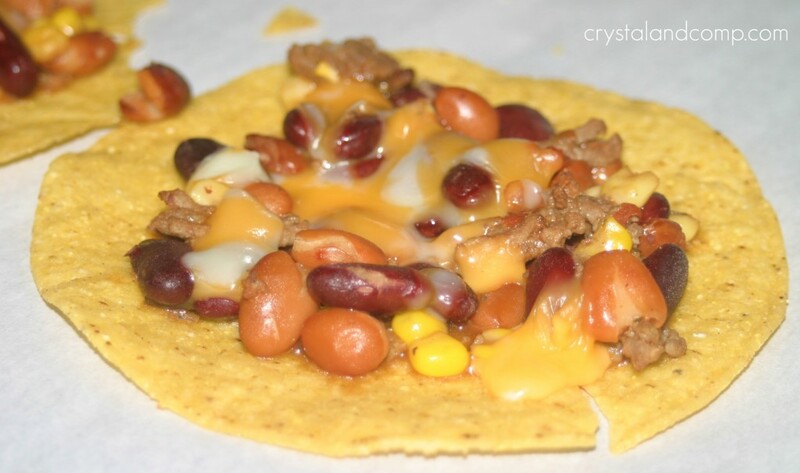 Drain the leftover Taco Soup with a strainer or simply spoon the meat and bean mixture onto the tostada. Bake for 15 minutes or until the cheese is melted. Once done, plate it up and top with lettuce, sour cream, salsa, guacamole or toppings of your choice. I am sharing this recipe on these resourceful sites: i heart naptime, the girl creative, C.R.A.F.T. craftomatic, crafts keep me sane, skip to my lou, making the world cuter, sumos sweet stuff, mad in crafts, tip junkie, tasty tuesday, tempt my tummy tuesday, craft edition, hope studios, todays creative blog, sew much ado, someday crafts, we are that family, blue cricket designs, somewhat simple, paisley passions, house of hepworths, fun to craft, fingerprints on the fridge, tidy mom, a few of my favorite things and it’s a hodge podge life. Looking for a more copious list? Here are over 50 sites to search for and share projects and tutorials. we (as in me) are totally making the taco soup tomorrow! i got all (i hope) the ingredients this weekend. i’m putting it in my crockpot and can’t wait!!! Yum..that sounds good and what a great idea. One of my biggest pet peeves is wasting food. My kids call leftovers ‘recycled’ food, because I use leftovers in meals like you did with this. I think this would be a perfect ‘recycled’ meal. It’s only 6:30 in the morning but that Taco Soup looks delicious! I love your creative way to use the leftovers too. I’m putting this on my dinner list for the week. Thanks for sharing! Kim, the soup is so easy, and very delicious! Hope you enjoy. This looks delicious! I never thought of straining my soup for tacos, I always just warmed up the soup and ate it like that until it was all gone. Hi, thanks for sharing this recipe at Strut Your Stuff party – I’m visiting around for recipes this week, and am glad to add yours to my family’s future menu options. Love taco soup! This is a great way to use up the leftovers! Thanks for sharing your recipe and linking to Tempt My Tummy Tuesday! We always make a big batch of Taco Soup, but I’d never thought to drain it & use it like this. Thanks for the idea. I’m definitely going to try it next time! Easy is my favorite! Thanks for sharing!